Bank of Mongolia homepage, February 2019. The word tögrög (төгрөг) refers to "circle", or a "circular object" (i.e. a coin). Today, it is rarely used outside of referring to the currency, with the exception of the phrase tögrög sar (төгрөг сар), meaning "full moon". 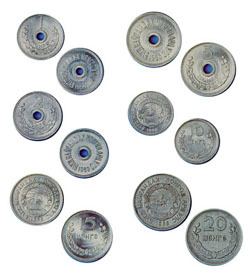 The tögrög was introduced on December 9, 1925 at a value equal to one Soviet ruble, where one ruble or tögrög was equal to 18 grams (0.58 ozt) of silver. 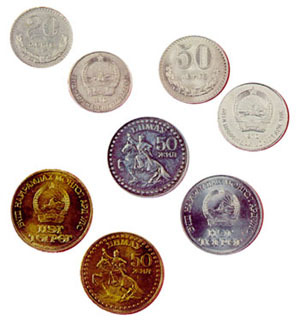 It replaced the Mongolian dollar and other currencies and became the sole legal currency on April 1, 1928. 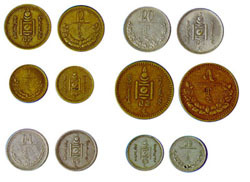 Möngö coins are no longer in circulation as currency, owing to their negligible value. Today, they are sold online and to tourists as collectibles. 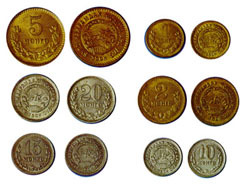 During socialism, the tögrög coin denominations were 1, 2, 5, 10, 15, 20, 50 möngö, and 1 tögrög. 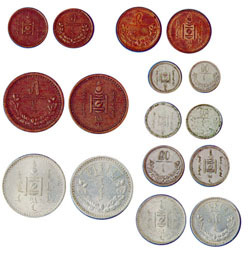 After the Mongolian People's Republic came to an end in 1992 and inflation surged, möngö coins were abandoned and larger tögrög values introduced. 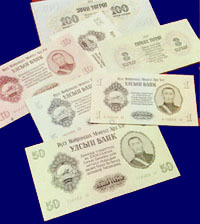 Formerly, all banknotes were printed in the Soviet Union. 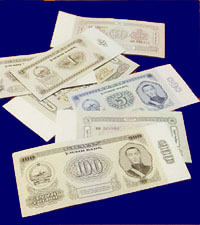 Modern tögrög banknotes are generally printed in Great Britain. 10 möngö 45 × 90 mm Pink Soyombo, Archery Archery — 1993 Very rare in circulation. Abundant among collectors. 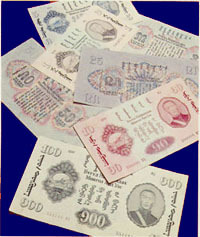 Issued dates are listed for up to 2003. It is known that there is a 2005 edition of 10 tögrög, but it is yet unclear whether or not it was the only value for the 2005 edition. 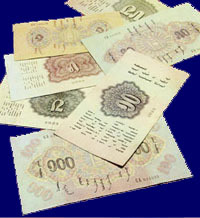 Lower value notes (10 ~ 500 tögrög) issued in 2000 and after have line-patterned color underprint on the entire note, where the previous edition had near-white solid color. But one exception to the rule is the 2000 edition of 500 tögrög. High value notes (500 ~ 10,000 tögrög) issued in 2002 and after have a patch on the lower right hand side of obverse as an improved anti-counterfeit device, which used to be printed only on the two highest values. The new patch is also more sophisticated than the ones in the 1990s. The Soyombo symbol was upgraded to a hologram on the two highest values. In China, there is a homonymic currency called (arad-un jogos) tügürig, the Mongol name for the Renminbi, which is also divided into 100 mönggü. 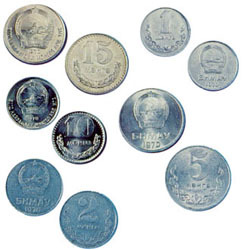 10 tögrög: (US$0.0038) Used for buying well water and for change. ^ Chi, Leisha (17 August 2016). "The sudden slide of the world's worst performing currency". BBC News. Retrieved 2018-01-01. ^ Bank of Mongolia. "History – National Currency – Togrog". Archived from the original on 2007-11-12. Retrieved 2007-12-15.